I carried out the following interview with Pervez Malik at a time when I was temporarily led to believe (through some opinions of Ahmad Nadeem Qasmi) that the value of art is determined by the degree of pain it inflicts on the audience. Pervez Malik happened to be one of my role models but he was firmly opposed to this dark theory of art. The anonymous "critic" mentioned in the interview is none other than myself. I am glad to say that now I find myself to be completely on the side of Pervze Malik against my former self. For that too, I am thankful to him. After this interview, he was kind enough to meet me again more than once. He avidly read my biography of Quaid-i-Azam and praised it highly. He affectionately went through my first screenplay and discussed it with me. Those sessions were as good as coaching, and hence I consider myself to be his pupil. While discussing my screenplay, he argued that I should not end it on a note of despair (as I had). He presented an extremely sophisticated argument supported with choicest examples from literature and cinema to show me that a movie or story should always depict someone bringing about a positive change through their efforts, even if they have to sacrifice their life for it. To him, even the greatest tragedies were about the victory of virtue over evil. They were called tragedies just because the victory was won at the cost of the protagonist's life. This is an idea that permeates through all his work. I must mention here especially two. The first, his response to the evil movie Maula Jatt (1979) and the second, his take on what he called "the brain drain" (intelligent and capable Pakistanis leaving their homeland and settling abroad). In February 1979, a Punjabi film based on a character created by Ahmad Nadeem Qasmi was released in Pakistan. It was called Maula Jatt. The message was that individuals should take law into their hands and settle vendettas through violence and mass murder. The movie became extremely popular among a certain segment of our society and spawned many - too many - sequels. Malik responded by making an Urdu film Rishta (1980). "This is the land of Sohni and Heer," the protagonist in Malik's film alludes to the famous love stories of Pakistan in an unforgettable moment in that film, and goes on to ask: "Why has a blood-dripping gundasa [sharp blade] become the symbol of our culture?" The climax of that movie takes place in a broad field where two feuding families stand against each other. The villain fatally wounds the hero's mother. The hero wants to get even but his dying mother stops him and tells her muderer that vendettas must end; we should not pass on a legacy of hatred to our successors. "Therefore," She goes on. "In the name of our Beloved Prophet who was a mercy to all worlds, I forgive you my blood - and I forgive it here as well as in the Hereafter. Nobody should take my revenge." This was Malik's reply to Ahmad Naeed Qasmi, to his iconic 'Gundasa' and to the legacy of violence which the priests of high culture have unleashed on the land of the Sufis. 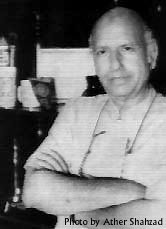 Malik was probably the first Pakistani film maker to have a masters degree from the University of California in 1963. Resisting the temptations of a career in Hollywood, he preferred to return to his home country and serve it. As such, he was quite disturbed about intelligent and capable Pakistanis settling abroad. He addressed this issue in at least two of his movies. Today, we may argue that non-resident Pakistanis are also playing an important role for Pakistan and on that ground we may feel justified in ignoring some of the points made by Malik in those movies but even then we might be compelled to admire the sophistication with which he presented his argument in films like Kamyabi. In that movie, the hero is a Pakistani who has settled in Canada. He falls in love with a Pakistani woman who wants to return to her homeland. When he fails to convince her that living in a developed country is better than going back to a third-world homeland, he asks her tiredly, "May I ask you, what is it that you find lacking here?" She looks at him and, after a moment's pause, she says calmly, "The sound of azan is not heard here." (Azan is the Muslim call to prayer). With these introductory lines, I offer you the interview which I conducted with Pervez Malik, my "teacher", a very long time ago. Afternoon, March 16, 1966. Naz Cinema, Karachi. The scene opens on a night club. The atmosphere is lively with a band, drums and the guitar. Young couples are shown taking to the floor, gyrating to the Western music. The camera tilts right to show a young man (black suit, with his back to the camera), probably finishing off his coke, while his stooge tries to draw his attention to the "beauties" on the floor. The young man is apparently not too interested. (Cut to the next shot). Another part of the club. The camera now shows us the entire orchestra. Suddenly our young man enters the frame from the left, and starts singing (playback, Ahmed Rushdi): Meray khayalon pay chhai hai ik soorat mutwali si... Kokokorina, kokokorina! Thus, on the ninth minute of the first public screening of Armaan, the fourth venture of Film Arts, the history of the Pakistan film industry was re-written. "The basic function of a director is to visualize his own film before it comes into being. For instance, when I used to picturise the songs, first we would all discuss it - myself, the songwriter, the music director. But it is the music director who gives the final ‘pieces’. I listen to the music, trying to get the mood of each piece. For instance, if a piece suggests movement, I would film it in a moving shot. If I film it with a static shot, it won’t give the right effect. So, I would concentrate on the song, playing it in my mind like background music, trying to catch whatever would come, until I could almost ‘see’ something. Then I would go to the location. You juxtapose your vision upon the location and you actually get the shots. Finally, I would sit down, correlating every individual piece in the music to a specific shot, and working out the details of each: the artists’ position, the camera angle, the frame, and so on. Direction is something about realizing your vision on the silver screen." A critic’s comment: "Pervez seems to be especially fond of ‘movement shots’ in his songs, and also of songs picturised on a mobile vehicle. Almost all his early films contain examples of these -- perhaps the most well-remembered one being Mujhee talash thee jis ki from Jahan Tum Wahan Hum (1967) -- if you live in Karachi, then you may be one of the thousands who recall it every time they get into a Victoria [a horse-driven cab]." Another famous, but not quite ‘fashionable’ one would be Mujhe tum say mohabbat hai, filmed on a donkey-cart! This lilting number occurred in Pervez’s very first release. Pervez says: "Heera Aur Patthar was a success, but my directorial innovations went unnoticed by the Press or by the film community. Nodody turned around to say ‘who is this Pervez Malik?' When our team (the "famous four" of the sixties: Waheed, Pervez, Masroor and Sohail Rana, the music composer) took up Armaan, I came back with a vengeance, determined to do something that would force everyone to take notice. This time, I was working on a fresh project, so I had the liberty…"
A critic’s view: "The rest is history. Armaan was the first Pakistani film to celebrate a Platinum Jubilee (75 weeks). It created the legend of the chocolate hero; and Waheed became the heart throb of thousands. Armaan is definitely wrothy of being considered for other merits as well. The song sequence Jab pyaar mien do dil miltay hain is a masterpiece of symbolic filmmaking… When a person is photographed between bars, it signifies depression or misfortune. Pervez has made extensive use of this convention in his early movies, especially in this song sequence." Pervez says, "After the record breaking response to Armaan, we became rather careful not to become captives of our own success. We knew that if we make another love story, no matter how good, people will say: this is not better that Armaan. So we decided to make a film about the problems faced by young widows… Ehsaan (1967) was quite an unconventional film (in the sense that its heroine is not just a widow, but she is also the mother of a seven or eight-year-old girl when she first appears in the film.)" Doraha (1967), Pervez’s own production in partnership with Sohail was, comparatively speaking, a flop. "I do not blame Sohail. He gave nine songs in that film, and all of them were hits. It was all my fault. I had become too much obsessed with my feats of directorial innovations. In Doraha I filmed songs in a manner which fascinates people even today, after a lapse of almost thirty years. I introduced a fresh approach towards camera movement, cutting, editing, and so on. But in the process of doing that, I allowed myself to ignore one most important aspect of filmmaking: the script. I had read a short story in the Reader’s Digest about a singer who dies. We got it adapted for the screen, but we introduced a side character, a lively girl. "In order to satisfy her, we kept the hero alive after his beloved is married away, and had him survive the wounds he acquires while saving the life of her husband. This, saving the hero’s life, proved fatal for our film. This was the greatest flaw in the story, and ruined the effect. "I learnt more from the failure of Doraha than I had from the success of Armaan. I sat down and analysed the situation. Meanwhile, I happened to be present at the screening of a Shabab Kiranvi film, which used the most basic technique of all: a fire place in the middle, camera shot, hero enters from right, heroine enters from left, they speak, he goes back his way, she exits the frame from her side. There is nothing more basic than this. That film was a success, nevertheless. Now just think about Doraha! I reached upon this conclusion: clever photography is no substitute for a good story. Consequently my next venture was Saughat (without Waheed Murad, for a change! ), where my techniques were much simpler as compared to Doraha, but which had a stronger storyline. I allowed the subject matter to become more prominent than my ‘technique’. I think this is how it should be. A director should not draw attention to himself. In a well-directed film, you should hardly think about the director’s work while you are watching the film. He should give you everything just as you need it - close-up, etc. You leave with an overall impact, and that’s all. "But this is not always easy. Quite often we (the directors) are carried away by a desire to show off. We get praised Wah, wah, Kya shot hai -- but that is, strictly speaking, against the basic principles of direction. My next venture was Mere Hamsafar (1972). Our unit went to Europe -- England, France, Holland -- for the first time. It had a very good musical score from Sohail, but suffered from a mismatch: when Sohail was preparing the score he had Waheed in mind, who was going to be the hero of this film. Due to certain differences which grew later on, Waheed’s role was given to Muhammad Ali. I think Ali Bhai did a good job too, in spite of the fact that the songs were tailor-made for Waheed -- not just the composition by Sohail, but also the rendering by Ahmed Rushdi, who had this flair for singing songs in a manner that would suite the specific actor who was to play it. It is a fact that when he would sing for Waheed, it seemed as if Waheed himself was singing. "Ahmed Rushdi was the king of expressions. I won’t say he was fond of acting, but he had this natural talent of expressing himself in voice as well as expression -- as you could see from his later appearances on the television." A critic’s comments: "Most of Pervez Malik’s early films are distinctly divided into two halves. A commercial, entertaining first half and a sad, tense, second half." Pervez says: "This was a formula. A binding. Those days people just expected to be entertained in the first half and then weep in the second." A critic's comment: "Pervez made this formula stand on its head in Mehman (1977)…"
Pervez says: "If you get a story which demands something else, then you do it. This film was based on a novel by Salma Kanwal. The novel begins with a tragedy, so the first half of my film was tragic. In this case the second half was romantic." A critic’s comment: In the early eighties, Pervez Malik surpassed his own Armaan with Anmol, which ran for 118 weeks in Karachi. It is ironic, because Anmol (although quite entertaining in its own right) was not even comparable with Armaan or to the earlier Pervez Malik hits in terms of finesse. It seems he wanted to be one with the Lahore film industry. However, the film had a haunting musical score by Nisar Bazmi. After Anmol came Dushman (1974), Pehchan (1975), Intikhab (1977), Qurbani (1981) and several others. Qurbani is regarded as his best, even by Pervez himself, on the basis of its strong screenplay. But none of these films reflect the touch of Pervez Malik. Ghareebon Ka Badshah, one of the most successful movies of the latter part of his career has a few sequences which really move us -- such as when the advocate recognises the dead body of his lost daughter, the girl he had unknowingly allowed to get raped. But, on the whole, the film sufferes from poor direction and crude sensationalism being passed off as social message. The director who had intrigued a people with Armaan, and bravely defied all conventions of the Pakistani cinema with Doraha, now, had apparently compromised with the degenerate industry, although it was a compromise much on his own terms. When did the downward slide begin? As a critic, I would say the heartening success of Anmol, back in 1973, was a thin veneer over the greatest defeat of Pervez Malik: his decision to compromise. Pervez says: "In my life, Anmol is a significant movie for two reasons. Firstly, that was a lean period of my life. In spite of my early success there came a period when things became difficult for two or three years. For some reason people had spread rumours about me in Lahore. I was not getting the response which I felt I deserved from the trade. So I was planning a comeback, to make a film that would divert attention back to me. Secondly, my producer Anis Dossani had returned from East Pakistan after having lost everything there (in the tragedy of 1971). Once he was a millionaire, a big businessman, but now he did not even have the funds needed to make a single film. He arranged funds with great difficulty. So, I was very careful about making something that would be a ‘sure shot’. I spent a long time searching for a suitable plot. The character we created for Shabnam was a contrast to the docile male character that was played by Shahid. It was also a total change for Shabnam. She had come with a very soft image. Now, I asked her to paint an entirely different character." A critic’s comment: "Three of the ‘famous four’ turned outwardly patriotic around (or before) mid-seventies. Sohail had already left filmdom to devote himself to national and children’s songs. Masroor got famous for Sohni Dharti (incidentally, once again, a Sohail Rana composition). Pervez turned into something like a social reformer and a patriotic propagandist. Dushman (1974) included a national song, Pehchan (1976) was about the blessings of the village life, and included family planning propaganda while Intikhab was a children’s movie (a spin off from The Sounds of Music.) The more recent ventures such asGumnam, Kamyabi, Ghareebon Ka Badshah were all recognized by the government as some sort of social service and consequently received tax exemption from the Federal Government. Pervez says, "I thought I must show my gratitude to the Almighty for granting me the success that I got. Even in my early films, I had always been prepared to include any nice things that I could. Later on, I realized there are so many problems in our collective life, which have never been filmed. The government, the politicians were always saying that islahi films are never made here. So I decided to make them, but there is no recognition. After having made seven films on national issues, I say it is a thankless job. I lost out on finances, there was no support from the government. Tax exemption is a joke. They send you a letter, stating that the Government of Pakistan is pleased to exempt you from tax, etc, etc. But this letter is issued by the Central Government. You then have to take it to the provincial government, and beg them to exempt you from tax which they refuse. I got exemption four times, but I can tell you that the financial gain of this was, literally, zero. When I received exemption for Kamayabi, I am on record for returning the letter to the government, saying, I thank you, but this letter of yours is an insult to the Central Government as well as to me, personally. But we were talking about my turning to social issues in my films. Someone once told me, ‘Pervez Saheb, your rizq is haram,’ I said to him, and then I repeated this in the convention held by Ziaul Haque, that, if my films increase vulgarity, obscenity and bay-hayai in the society, then it is not just haram but also hellfire for me. But if, in my whole life, I could reform even a single person through my films, then it is not just halal for me, it is also ibadat (worship)." Pervez says, "such issues are rather tertiary. They come later, only in a free society. Now your courts are discussing them, but such issues have political overtones, whereas I have always wished to avoid it. Since you have to get your film passed by the censor and every government has its own policy, so you cannot say a controversial thing -- even if it were true. So, you must turn back to the safe avenues -- such as the love of one’s homeland, or that playing up of ethnicity is a dangerous thing, as I did say in Ghareebon ka Badshah. As far as democracy is concerned, we have always had strange situations in our country. There have been periods of dictatorship, and periods of democratic governments. There has never been a stable democratic government for such a long period as to make such issues possible in films." I like this a lot. Thank you for it! 1. "The basic function of a director is to visualize his own film before it comes into being." That seems to be (according to my current understanding) Iqbal's premise with regard to art/literature (coupled, of course, with the fact that it should be supportive of the unfolding of humanity's true and full potential). Be an active creator of what is envisioned. Envision something that ennobles, uplifts, and supports the unfolding of the *totality* of humanity, instead of some minimal, constricted, or perverted expression of humanity. The director is us. 2. "A director should not draw attention to himself." This speaks strongly of the selfless consciousness, a service consciousness, a service ethos devoted to holding precious, and uplifting, service to humanity (as opposed to self-aggrandizing service to oneself). 3. "Quite often we (the directors) are carried away by a desire to show off." See # 2. Showing off pulls attention back to oneself, and thus the outgoing service-consciousness is turned back upon oneself, and the open hand closes into a fist. 4. "...if my films increase vulgarity, obscenity and bay-hayai in the society, then it is not just haram but also hellfire for me. But if, in my whole life, I could reform even a single person through my films, then it is not just halal for me, it is also ibadat (worship)." Wow...this says so much. It says to me that Service to Humanity (in this case through ennobling film) = Worship. I like this a lot. Thank you again for taking the time and effort to share it. It's is a very enlightening post and a very enlightening comment by Robert.